Ahoy, matey! This pirate's den has been invaded by a squadron of sultry Sirens. The tower is similar to The Mirage in size and layout, meaning slightly smaller-than-average rooms. The room decor is neutral browns with the now common off-white bedding. Dark wood dressers and furnishings and a decent-sized flat-panel TV on the wall. 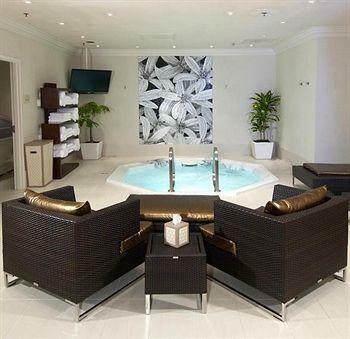 The bathrooms are above average with marble floors and hair dryers. While you shouldn't do it, the hair dryers are easier to sneak home with you than the new floors. There is also an iPod dock alarm clock in the room, so you can wake up to your prized recording of "Flash Turnipseed." 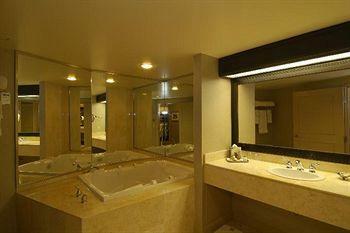 Standard amenities are a single sink and soaking bath-shower combos. The closets are large and have safes. One downside is the serious lack of pirate theming. We want a keg of grog! All rooms are equipped for high-speed Internet access for a ridiculous fee, and if you're willing to pay you need help with your addiction. The in-room safes are wonderful for people who have big stacks of cash to store. 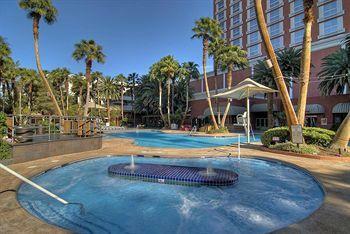 The location is good, within walking distance of both the Center Strip and the North Strip. 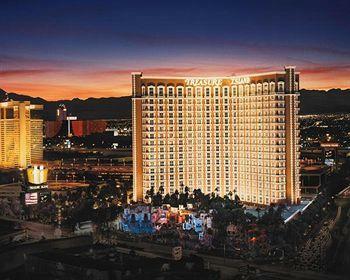 Check-in is usually handled very professionally at TI - Treasure Island Hotel and Casino Las Vegas, and the lines go quickly during rush hour. Room service is good, too, but you could easily spend $40 on breakfast for two, when $1.98 will get two complete breakfasts at some dingy joints, and you get way more grease, too! Conditioner, shampoo and some lotion. The hair stuff is orange-scented and comes in cute little bottles that will make a great Christmas gift for a relative. It appears they usually have the grand prize, the sewing kit complete with buttons, but not always and you have to check the drawers for it. We probably should stay here again soon, because our pants keep falling down. Young to middle-aged, upper-middle class. Surprisingly, you find very few pirates about, which makes for a safe, but less interesting, stay. 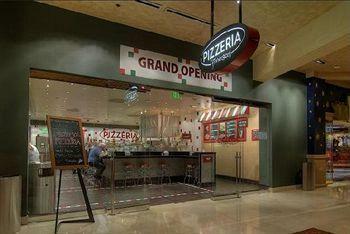 A lot of Californians stay at the TI Hotel and Casino Las Vegas for their weekends. and, as you'd expect, the pirate theme draws plenty of families to this resort (maybe because parents want their kids to be kidnapped). Rumor is that they want the kids to stop coming, though, charging big dough for every third or fourth person in a room. Small, odd-shaped and not so great. 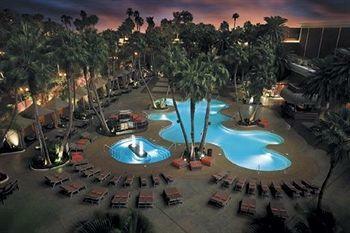 In fact, the TI - Treasure Island Hotel and Casino Las Vegas pool is too small and crowded for the size of the property. The pool is heated, but closed during winter. A steep $25 resort fee per accommodation, per day. This covers Internet access in your guestroom, buy 1 cocktail get 1 free coupon, local phone calls, limited faxing, daily newspapers, fitness center access. You get a $20 credit for your next stay, maybe to help cover the resort fee? The overall value of this place is ideal for a medium-sized budget, but the only pirate stuff that remains nowadays is for sale in the gift shop. Lots of everything, like Let It Ride, craps, blackjack, roulette, oddball card games and the casino's favorite, the Big Six wheel. The dealt games use the highly unpleasant automated shufflers that the casinos did not put in place for the customers' benefit. 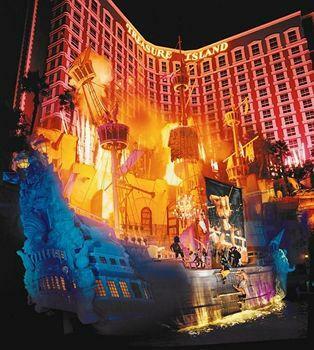 Play at TI - Treasure Island Hotel and Casino Las Vegas if you like the atmosphere and don't mind losing. The cheapest craps game is $10 during weekdays, same with blackjack, but not always. Often, the games require at least $15 to get in on any action. Watch out for their single deck blackjack, because it pays a horrifying 6:5 on blackjacks. Craps is the standard 3x4x5x. All of the games have electronic minimum and maximum signs that they can change in an instant, depending on what the prime rate and federal reserve are doing. Slots from a penny on up to $100. There are a very limited number of full-pay video poker machines that we know of. Hey, someone's got to pay all those actors dressed like pirates/Sirens in the battles out front. Very good. They know how to mix a stiff drink. The service is not the fastest, but the drinks are some of the best you can get for free. It's a slightly-below average return compared with off-strip hotels. It rewards play at all levels. Of course, it may take about three weeks at the nickels to get that gourmet dinner comp you have your eye on. If you do rack up a bunch of slot club points, you will probably get mailed offers for free and discounted rooms. Comps at the tables are for $50 bettors and higher. Rooms will be given to you at the $100 and up level. 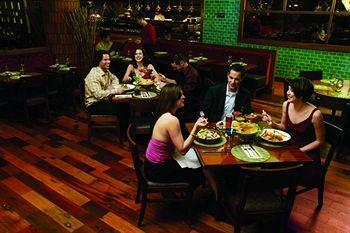 Senor Frog's Las Vegas at the Treasure Island Hotel and Casino opened its doors on party holiday Cinco De Mayo. 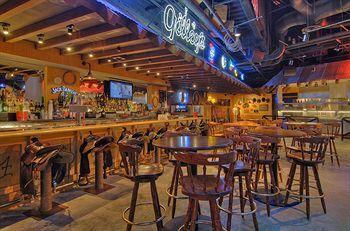 Enjoy the live entertainment and throw back a few shots to get the night started. Grab a plate of fajitas, steak tacos and a couple of yard glasses to fill your growling stomach. Don't forget to follow that conga line! Sirens of Treasure Island show Las Vegas is a free pirate show on the Las Vegas Strip. Sounds like a great things, right? Pirate ships, battling it out. Girls in tight fitting pirate outfits surrendering the booty. And it's free! Well, there's a reason it's free, but if you're one of those people that can't resist a deal, whether it's a good deal or not, this might just be the show for you! Aerial performances, acrobatic acts, flying trapezes, and so much more! 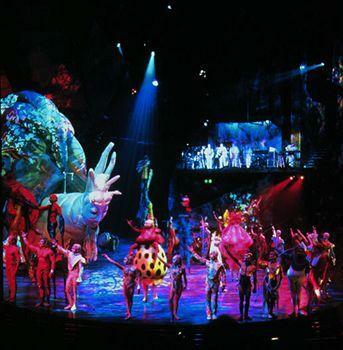 Located at the Treasure Island Hotel and Casino in Las Vegas, Nevada, Mystere is a must-see for anyone visiting the Las Vegas area. 11 big screens total, one of which is the great big mama and the other 10 are her cute little babies. Eighty screens with mini-TVs for those of you who love watching horses being forced to run around a track against their will. Forty seats are for sports with twelve more seats for keno in the room. About 12 with electronic boards. You bet! Seriously, you bet and you get drink tickets. You don't bet and you get bupkus. No reasonable cost ones, so bring provisions. Or eat at the Canter's Deli if you're rich. 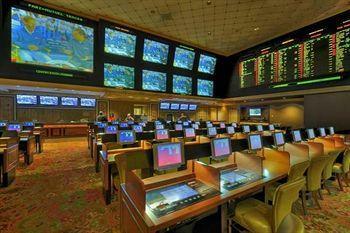 The TI - Treasure Island Hotel and Casino Las Vegas sports book room is about average in every way for the Strip. Which means it's way nicer than your living room, but not among the top books in town. Eight tables in this little room, which, to its credit is actually a little room, not a roped off area. Chairs are average. It seems these may be the only thing in the room they didn't spend a little extra on. The tables have maroon felt. Pretty closed off. There are walls and a doorway, and it's pretty quiet in here. TVs are all over the walls. 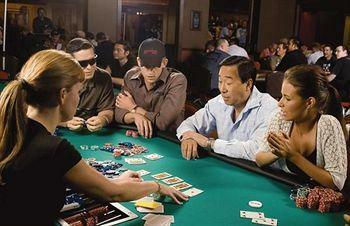 It's mostly Texas Hold 'Em at Ti - Treasure Island Hotel and Casino Las Vegas, in both the limit and no-limit varieties. Limit starts at $2-$4 sometimes, and the NL starts at $1-$3 with a $500 max buy-in. Omaha may get dealt if demand is there, starting at $4-$8. They also claim they will deal any game at any time. No beginner classes but plenty of beginners and players who should stop thinking they aren't beginners. Some very soft games at all levels can be had. Pretty crowded. There is enough there to attract the hotel guests, and enough people who have heard about the wild, loose games to fill the joint. 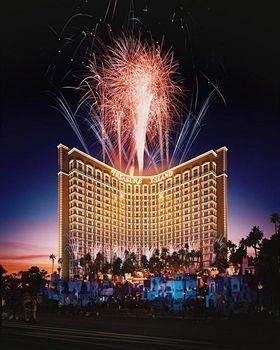 Expect some delay at TI - Treasure Island Hotel and Casino Las Vegas on weekends. A generous $2 per hour with your card. As we said before, soft as the down on a duckling. Sure, there are some good players, but for the most part, this is a very weak room with a lot of callers to see the flop and some who will hang on with Ace high. This is better than a me-too room. The room and tables are nice. The soft players are a bonus, but the lack of actual variety hurts. There are four nice tournaments a day at TI Hotel and Casino Las Vegas with a fairly cheap buy-in and somewhat-deep stacks. 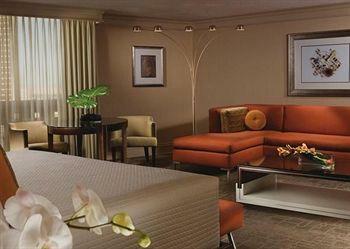 Choose between one king bed or two queens in this 400 square foot basic room that Treasure Island calls deluxe anyway. Premium bedding with triple sheeting comes in handy when one or two layers of sheeting just isn't enough. Wired and wireless Internet access comes with your resort fee, as does a refrigerator, desk, and laptop-compatible safe. Ensuite bathroom comes with shower/tub combination with a deep soaking tub. The Strip View Room is the same thing, but (as implied) with a specific view of the Strip. 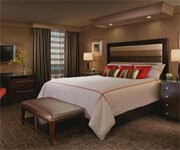 One king bed graces this 630 square foot mini-suite with a view of the city, mountains, or pool. A separate sitting area, desk, and 32-inch LCD TV with digital channels, first-run movies, and pay videos will keep you busy. Same complimentary Internet and standard room fare that is actually not completely complimentary. Ensuite bathroom includes shower/tub combination with jetted bathtub. 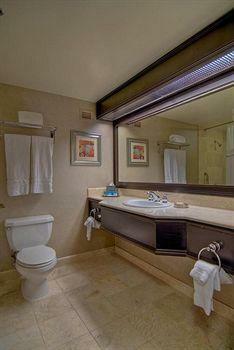 Bath amenities include double sink, hair dryer, and designer toiletries. A second bathroom, perfect for larger parties and too many girls trying to get ready for a night out at the same time. 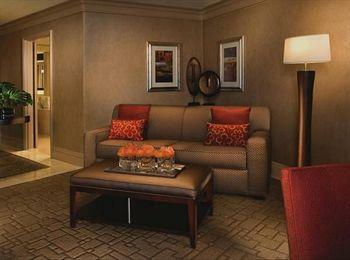 For those who want a little extra breathing room, this 930 square foot suite does the trick. One king bed, with TI's premium bedding and triple sheeting. Views of the city, mountains, and/or pool. 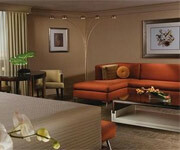 32-inch LCD TV and other amenities the same as other suites. The ensuite bathrooms come with shower/tub combination and jetted bathtub, along with a double sink, hair dryer and designer toiletries. The room was SMALL. Had a corner room and was able to look down on the pirate show. The room was clean and quiet didn't hear the neighbors through the wall. the bath room was small and very odd. It had a separate tub and shower but the tub was same as many people have in their homes. the shower was so small that while I was in it I touched all four walls at the same time. The Shower head was on line with my nose. The casino floor seems to have been thrown together with little to no thought and the machines are tight except for Star Wars which while you never came out ahead you could play for a good while. Drinks were a little slow at times but very taste when the arrived. The service at the front of the house was great. The Valle service I did have a complaint about. That complaint is that they spit sunflower seeds onto the passenger side floorboard. I don't mind people eating in my car but is it really so hard to roll the power windows down and spit them out the window? They seem to favor Women for giving free rooms to because I've played there many times and for more money than my female companion yet she's the one who's always getting the free room offers. I love TI! 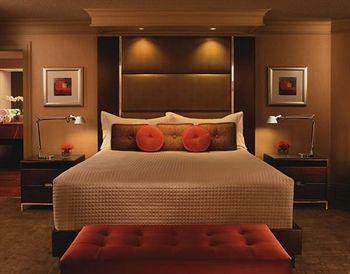 Is it the swankiest, most luxurious, fanciest hotel on the strip? Absolutely not. Is it above average? Absolutely. TI is fantastic for its location, its perfectly acceptable, decent even, rooms and its very reasonable Kahunaville restaurant. This is my wife and I second visit to TI and we love it. We arrived early AM on a Monday. Obviously not able to check in, we hit the strip. We returned around 10:30 AM and checke din. Check in was slower than our previous visit but not horrible (about 1/2 hour wait). We went to our room and called for our bags from the bell desk. A short while later a very chipper and excited bell hop delivered our bags. The service was just as good as our last visit. We hit the pool next. We love the TI pool. 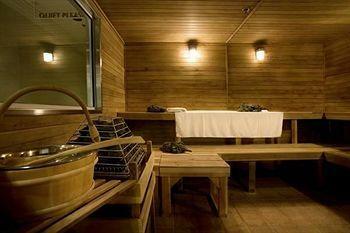 It is nothing fancy and on a Monday there is not much going on but we find the service great and the staff friendly. Drinks are expensive as they are anywhere. They have stupid toilets that you can get your drinks in for a paultry $28.00 bucks but they make a great souvenir for the kids and you can fill it with whatever you want so it makes for quite a sizable drink. We love to people watch and enjoy drinking cocktails by the pool. TI makes both of thise very enjoyable. We love to eat at Kahunaville. They have a salad, the Surf's Up Salad for $6.99. Add chicken for $3.00 and you have a GIANT salad. So big that my wife and I split one. Not sure where on the strip you can get a full belly for $3.50 a person. Nachos? Awesome! Now for some negative....Senor Frogs. Terrible, terrible, terrible. Walked in and waited to be greeted by a waiter. Well the waiters live up to their name, they make you wait and wait and wait and wait and wait. We waited so much that we decided to leave, never having spoken to anyone at the restaurant. Stay away from Senor Frogs. Sirens of TI......where do I start? That was 10 minutes of my life I will never get back. The show was so cheesy and bad that I can not even express in words how horrible it was. Overall, we love TI. 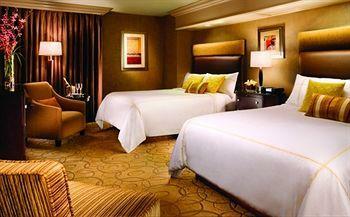 It is not the greatest hotel on the strip but for the price you get a very above average and nice Las Vegas hotel. We will absolutely stay there again and would recommend it to anyone. You are soooo wrong on this place Casino Boy!! Time for you to do another review. Their clientele is definitely 20-somethings as well as many, many children/infants. There is absolutely nothing to attract anyone other than those looking for a "cheap" price. Add in the (you get nothing for it) resort fee, and TI no longer is really "cheap". Housekeeping was good and having 2 bathrooms was great, unfortunately those are the only 2 good things I can find to say after 5 nights! Pretty sad, lesson learned, will never return.